Spheric Music, le label de Lambert Ringlage, fête ses 25 ans avec une compilation qui réunit entre autres, Bertrand Loreau et Klaus Schulze. Unreleased tracks by Klangwelt, Robert Schroeder, Axess, Vanderson, Heimann, Mesmerised (Palantir), Bertrand Loreau and Lambert, as well as the rare titles « Late Evening » by Joel Fajerman and « The Breeze » by Klaus Schulze. No, we are not Jean-Michel Jarre, Kraftwerk or Vangelis. 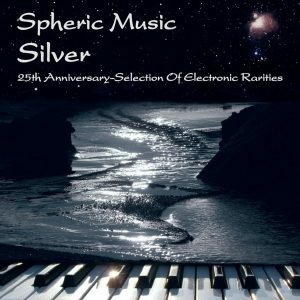 But Spheric Music celebrates its 25th birthday by presenting again a precious, high-quality electronic sampler with unreleased jewels of Spheric Music artists as well as 2 rare bonus tracks by Joel Fajerman and Klaus Schulze! The opener by Joel Fajerman, known for his french film music, is a rare track of his archive, which is the debut for Joel Fajerman on Spheric Music (a further release is scheduled). Also a rare gem came by Klaus Schulze. It is a honour to have him on board with „The Breeze“, a title long time go released on the “Contemporary Works 1” Box (out of stock for a long time). The CD ends with the earworm “Silver” by label owner Lambert. The album is characterized by melodic electronics, rhythmic-pulsating tracks, harmonic sounds, melancholy atmospheres and traditional Berlin School titles. The featured artists are known for: Joel Fajerman (L’aventure des plantes / the secret life of the plants), Robert Schroeder (Cygnus-A), Klangwelt (Weltweit), Axess (Pyramid Peak), Vanderson (Vandisphere), Rudolf Heimann (Touch The Sky), Mesmerised (Palantir – Empire Of Illusions), Bertrand Loreau (Le Pays Blanc, From Past To Past), Klaus Schulze (Mirage, Moondawn etc), Lambert (Light Sky, Drachenreise). It is a real treasure box, full of musically shimmering jewels.